For more fun iPad cases (see previous posts), Speck has some original designs for protective cases and bags for popular portable electronic devices, from smartphones to laptops. The PixelSkin fits snugly around the iPad, wrapping around the front to hold the frame around the screen. It's available for the iPod for $39.95, in black, indigo, and green, and for the iPhone for $29.95, also in an HD version with finer pixelation. Or to pack up your iPad when travelling, there's the Speck PixelShield Carry Sleeve for iPad. Just slip your iPad in the slot and it's fully enclosed, and ready to go with the integrated handle. The design has a textured neoprene exterior, with one flexible side for the slot and the other firm reinforced side to protect the screen, plus a soft micro-fleece interior lining. The PixelShield is available for the iPod for $39.95, in black and red. There's also a zippered PixelSleeve for other tablets and netbooks up to 10 inches, and PixelSleeve Plus for iPad. In honor of that big game this weekend, it's time to move on from sensible and fun iPad cases (see previous posts), further out towards fun and crazy, with the Be A Headcase Bottle and Can Opener Case. No, really -- It's a bottle and can opener in a case for your iPhone or Blackberry, complete with embedded stainless steel bottle opener and tab for opening cans. This is a hard shell protective case that fits on the back of your iPhone. It has an outer rubberized coating to secure your grip while working with those cold and wet drinks. The Bottle and Can Opener Case is available in pink, or plain black for more subtle bottle popping, with models for the iPhone 3G and 3GS for $19.99, and the iPhone 4 and BlackBerry (coming soon) for $24.99. And there's more -- You can download the free Be A HeadCase App for the iPhone that senses when you open a bottle or can and counts your drinks. It also displays a selected picture and plays a song or sound to celebrate -- the provided sound effects include "Funky Monkey" and "Annoying Mother In-Law." Or upload your own favorites to share with others. All these cases and screen protectors (see previous posts) are great for protecting your portable devices from bumps and scratches in your pocket or bag, and can save the day when you accidentally drop your device. But wouldn't it be better to not drop it in the first place? So here's a simple solution, especially for people who are constantly working with their smartphone or tablet: the iTatch Lanyards -- with a suction cup on the end to hold on tight to your handheld device, even when you don't. 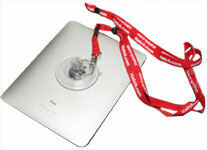 Just slip the lanyard around your neck, and attach the suction cup to secure your iPhone, iPod, iPad, or other smartphone, phone or portable device. There's the iTatch for iPhones/iPods for $9.95, with a roughly 20-inch lanyard and 1-inch suction cup for smaller handheld devices. And the iTatch EBook Anchor for $14.95 has a longer lanyard and significantly bigger 3 1/4-inch suction cup for iPads, E-book readers, and larger and heavier tablet-sized devices. For more fun, try out the iTatch Puppy Anchor for $14.95 -- You can restrain your (smallish) pup in the kitchen by applying the suction cup to the refrigerator or dishwasher, or on the go by quickly attaching to a store window! The TabGrip for iPad is something different from protective cases (see previous posts). Instead, it's designed as a multi-functional holder and stand to make using the iPad easy and comfortable. The TabGip is basically four arms of flexible rubberized plastic with grips that snap onto the middle of each side of the iPad. The grips are textured and rubberized, for a more convenient and more secure hold whether you are using or carrying your tablet. The outer sides of the grips are also hinged, and swing open to become stands to position the iPad for typing or for display, in portrait or landscape orientation. The grips and rubberized back also protect the back of your iPad when it's being handled or put down. The TabGrip is currently available for $39.99, in classic black. It's a clever design for people who use their iPad a lot, in many different positions and orientations -- standing up and sitting down, in motion for gaming or on a table for typing. These days the Apple iPod touch seems the be more like an iPad mini, since you can run all your same apps, and music and videos and photos and even books synced from iTunes, plus connect to the Web and email and more over Wi-Fi. But Apple also likes to promote the touch as "the most popular portable game player in the world." In thinking about cases for our devices, then, instead of worrying about protection from external elements, maybe we should focus more on protection from our own exuberance. So Speck (see previous post) has developed a specialized version of its CandyShell case, the Speck CandyShell Grip for iPod touch (4th gen). This is flexible rubberized case that snaps on the back of your iPod touch. It has a hard shell skeleton frame across the back and around the sides, with a rubberized interior for shock protection. The rubberized back is ridged for a solid grip, and there's also a small strip on each corner, and bump-outs at the top and bottom of the side edge bezels to help position your thumb for pressing virtual buttons on the touch screen. The Speck CandyShell Grip is available for $34.95 in black or white. Apple also reimagined its iPod nano in its 6th generation, as a tiny clip-on music player with a square touch screen (see earlier post). 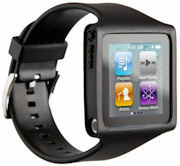 But instead of clipping it on, you can strap the nano on with the Speck Time To Rock wristband for iPod nano (6th gen), which turns your nano into a music watch. 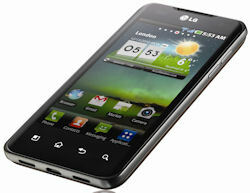 Just pop the nano into the protective frame, complete with rubberized button covers, and strap up. It also includes a headphone cord management armband to help route the headphone out of the way up your arm. The new nano is focused on music playback, and the Speck Time To Rock offers a new way to conveniently carry, and access, your music, for $24.95. The Joby GorillaMobile Yogi for iPad brings the now-familiar GorillaPod flexible legs (see earlier post) to the iPad, giving you great flexibility in stabilizing and positioning your tablet as you like it. The Yogi starts with a protective polycarbonate case with rubber bumper edges that snaps on the back of your iPad to protect it from shocks and falls. The flexible legs can be detached for storage with the quick-release clip, or can be attached on the short or longer sides for portrait or landscape viewing. Then the fun begins, as you can twist and bend the legs to use your iPad in some rather unexpected positions -- standing or leaning, adjusted for uneven surfaces, or even wrapped around fixtures or hanging down. The Yogi is good for positing the screen for shared viewing, and for finding a comfortable set-up for extended typing. It's available for $49.94, with white case and black legs. Not content with bringing the GorillaPod idea of flexible and adjustable legs to the iPad with the GorillaMobile Yogi case / stand (see previous post), Jobi has extended this theme to the case itself with the Jobi GorillaMobile Ori protective metal case that transforms into a multi-position stand. You start by snapping the iPad into the Ori's plastic frame with rubberized protective edges. The back is mounted on hinged cover made of a light silver aluminum / polypropylene composite that fold ups around the iPad as a folio for travel. And then the fun begins, as the Ori (think "origami") has pop-out tabs and hinges and rotating mounts to adjust into a variety of positions. Then rotate the back up on the 45 degree base to stand up the iPad for shared viewing. And you can try other positions, such as turning the base on the side to stand up on a table. The GorillaMobile Ori offers extreme flexibility in a solid but light protective case for $79.95, with lots of options for setting up your iPad for comfortable use, and for sharing with a group. In addition to its GorillaMobile Ori and Yogi iPad cases (see earlier post), Joby continues to expands its line of Gorilla-ish stands with its trademark ball-and-socket flexible legs -- with the GorillaPod line for digital cameras and camcorders from compact to DSLR, the GorillaMobile line for mobile phones, music players, gaming devices, and other portable devices, and Gorillatorch line of hands-free lights. I've found the GorillaPod line particularly useful for working with a webcam on the go (see earlier post on Demoing Smartphone Apps) and for setting up pocket camcorders like the Cisco Flip to shoot in informal venues, including hooking onto the church pew for musical performances (see Holiday Gadgets article). Even better, there's now a GorillaPod Video model, designed specifically for mini and pocket camcorders and priced at $29.95. To set up a secure shooting position, clamp or wrap the flexible legs tight around a convenient base, or use the magnetic feet. Then use the ball joint mount on the head to position the camera as desired. So far so good, but the key addition is an omni-directional pan/tilt head, to let you secure the legs and then have smooth 360 degree pan and 135 degree tilt control with the 5-inch handle. The head also has a quick-release plate for easy filming off the tripod. Shaky video is the scourge of these lightweight pocket camcorders, as you need to be careful to brace yourself for good video. The GorillaPod Video provides a great solution, since you have a solid base plus the ability to pan around the scene without bumps and shakes. The unit itself is very light, made from anodized aluminum, and the tension in the pan/tilt head is quite strong, so it's still best to hold the base while you pan and tilt. The result will be videos that are much more pleasant to shoot, and to watch. See my Digital Cameras Gallery for more on the Joby GorillaPod tripods and related accessories. Entries posted to Manifest Tech Blog in February 2011, listed from oldest to newest.